A newly identified googly-eyed artifact may have been used by the ancient Egyptians to magically protect children and pregnant mothers from evil forces. Made of faience, a delicate material that contains silica, the pale-green talisman of sorts dates to sometime in the first millennium B.C. 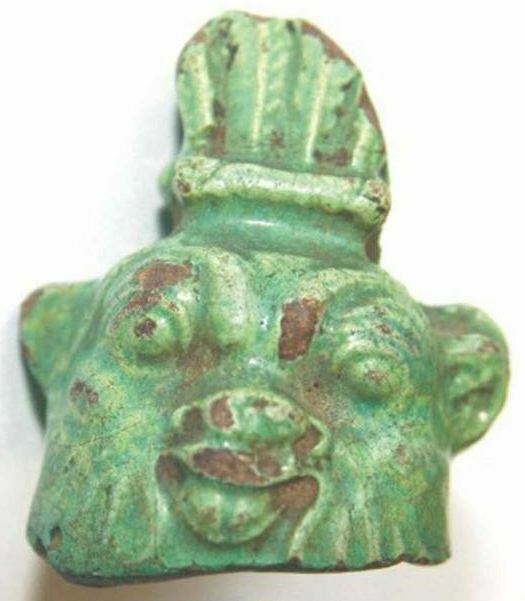 It shows the dwarf god Bes with his tongue sticking out, eyes googly, wearing a crown of feathers. A hole at the top of the face was likely used to suspend it like a bell, while a second hole, used to hold the bell clapper, was apparently drilled into it in antiquity. Carolyn Graves-Brown, a curator at the Egypt Centre, discovered the artifact in the collection of Woking College, the equivalent of a high school for juniors and seniors. The college has more than 50 little-studied Egyptian artifacts, which were recently lent to theEgypt Centre at Swansea University where they are being studied and documented. Graves-Brown told LiveScience in an interview that at first she didn't know what the object was. It wasn't until she learned of a similar artifact in the British Museum that she was able to determine that it is a faience Bes bell, one of a very few known to exist. "If you try to rattle it much it would (have) broken easily," she said. However, while faience is breakable, it held magical properties. "Faience is very often used for objects that have a magical or religious significance in ancient Egypt," Graves-Brown said. Making the find more intriguing is the quirky character of Bes himself. A dwarf god and protector of pregnant mothers and young children, Bes may look goofy to us with his tongue sticking out, however, his appearance, tongue and all, had a purpose. Graves-Brown explained that he would sometimes bare sharp teeth and "it's assumed, but it's not known, that this [appearance] was supposed to scare off evil spirits and evil entities." That may well have been the intent of this object. Flinders Petrie, an archaeologist who encountered items similar to this, wrote in 1914 in his book "Amulets" (Constable and Company, 1914) that bells like these were probably "worn by children against the evil eye." Graves-Brown exercises caution. She points out that none of the few surviving examples of this artifact have been found in their original archaeological context. It could be that faience Bes bells, like this one, were worn by pregnant mothers and/or children as magical protection against evil forces. Another possibility is that the bell was placed near a child, perhaps where the child slept. However there could be another explanation for the object altogether. "The Egyptians often made models of objects used in everyday life out of faience [and] gave them as gifts to the gods," she said, leaving open the possibility that this artifact was actually deposited in an Egyptian temple. Whatever its exact use was in antiquity, Egyptologists can take heart in the fact that Bes, a protector of young children, will be going to work for the kids again. Graves-Brown said the Egypt Centre has a program for school kids of all ages and, given that the artifacts are from Woking College, they hope to use them to get teenagers interested in Egyptology.